San Diego’s Lifeguards, including club member Ed Harris, joined Councilmember David Alvarez today to announce their endorsement for Mayor. The lifeguards endorsed Alvarez, citing clear differences in the two candidates and times where Alvarez’s opponent, Kevin Faulconer hasn’t delivered for public safety. Ed Harris, spokesperson for the San Diego Lifeguard Association said it was Alvarez who pushed the public-private partnership with Toyota forward providing new equipment for lifeguards and saving the City over a million dollars. 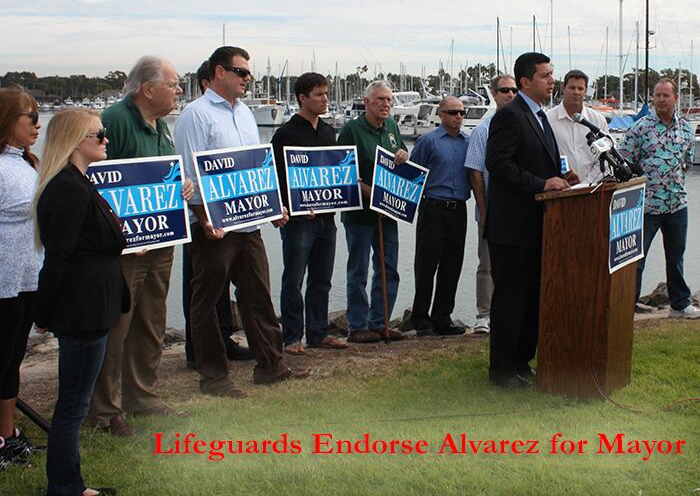 Alvarez stated that the coastal communities and San Diego’s economy rely on safe beaches and he’s been clear and consistent in supporting lifeguards and public safety since joining the City Council. Next PostBallots Hit the Mail Today: Start 2014 with a Win!